Have you ever said something and in the next second wished you never had? What happens when you say it on social media though? Well it can mean disastrous consequences on steroids! 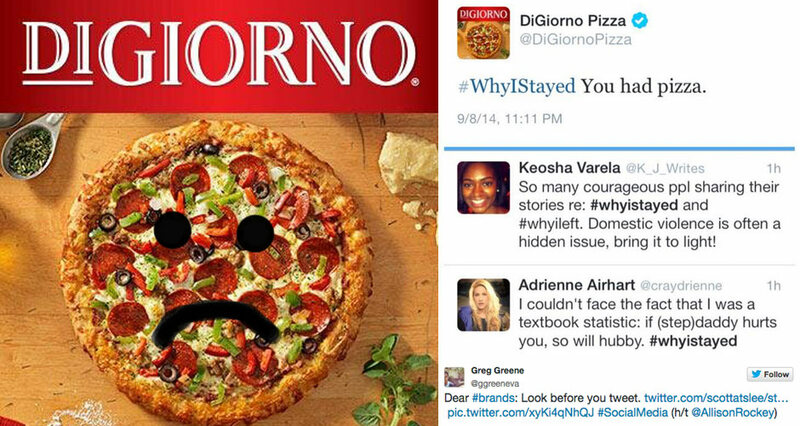 I’m sure DiGiorno Pizza would have liked to go back in time just a few seconds before riding the hashtag #WhyIStayed to read the context it was being tweeted in. The hashtag was trending on Twitter, in light of the recent suspension of football player Ray Rice for the use of domestic violence on his wife Janay Rice, encouraging women to open up about similar experiences. The DiGiorno tweet was perceived as an ignorant attempt to sell frozen pizza. The backlash was immediate and the tweet was deleted in a few moments. But that’s the things with social media, if it’s out there for a moment it has already had many eyeballs on it. 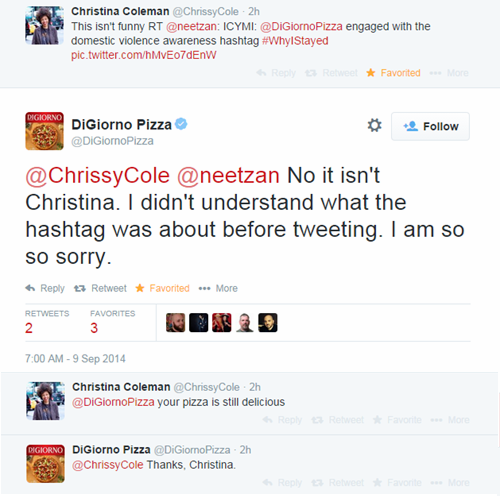 DiGiorno Pizza has always been witty at using latest Twitter conversations to engage its customers. But one careless tweet was all it took for its reputation to be endangered. Although there is no direct connection between domestic violence and pizza, but being associated in such an insensitive manner with this social cause, stirred angry reactions from people all across social media. And this is exactly what the brand did! They tweeted out apologies to all the scathing responses they had got to the careless #whyistayed tweet. Could have been avoided? YES. Brands should leverage social media carefully. Everyone wants to be seen and talked about on social media, but the question is how can brands do this responsibly? Trends spread like wild fire across social media, and this can either make you or break you. And this is precisely the reason that no business unit of a brand can work in silos. There is no separate job for PR and Marketing. This pizza disaster could not have been solved by a press conference or TV ad. Although the Twitter responses would have been sent out by the social media and marketing team, they would have needed the backing up of the PR team to formulate effective responses that would not blow up the issue. They would have needed the the support of tech department to run this entire operation instantly in real-time. Taking ownership of their fault and accepting their carelessness did a long way in salvaging DiGiorno’s brand reputation. It did not shy away from the issue but faced it head on and leveraged the same Twitter platform to win back the trust of the customers. In these delicate situations, especially involving social causes, people can take extreme stands to boycott the brands involved. There have been many instances in the past where brands have had similar disastrous moments due to negligence or lack of awareness of trending topics on social media. What has happened in most cases then, is that the social media account has been deleted either to avoid hateful responses or the issue in itself completely. 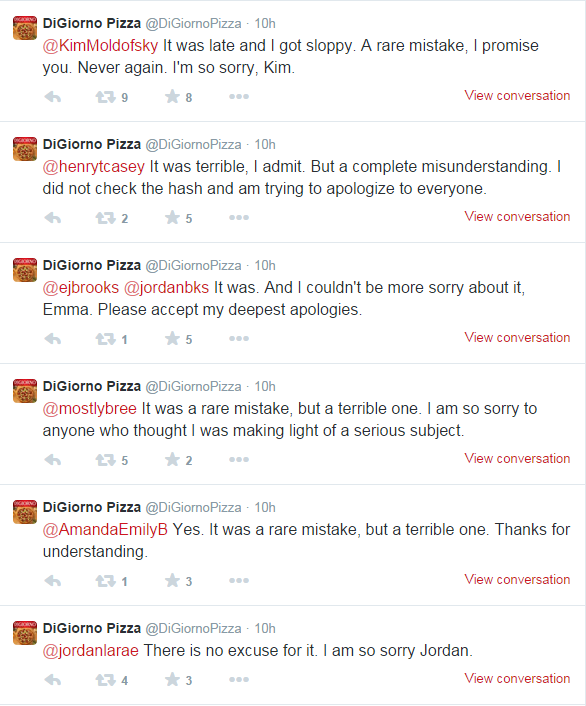 In my opinion, DiGiorno handled the entire issue in a mature, sincere manner which was evident in the genuinely apologetic tweet replies which were not copy-pasted, but personalized for each user. In this fast paced digital world where every move you make is tracked by social media for millions of users across the globe to view and respond to, brands have to find the right balance and pace to stay socially relevant in a responsible manner. And this in return highlights the importance of having functionally integrated business ecosystems within every brand that aspires to be of value in customers’ lives. And it’s good to see brands like DiGiorno Pizza adapting to these shifting trends in stead of making a run for the door! Previous PostThe Day Michael Kors Followed His Customers Next PostIs Big Data A Big Problem Or A Big Solution?